Got a "Fightin' Phillies" fan on your roster? You've come to the right place — our selection of legendary Philadelphia Phillies custom baseball gifts can't be beat! 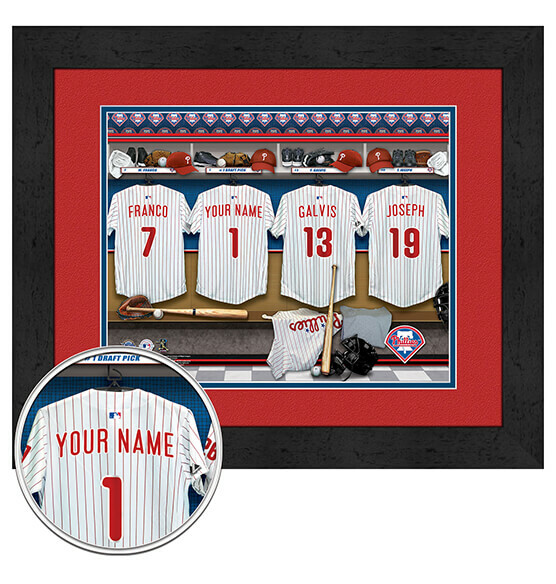 This Philadelphia Phillies Personalized Locker Room Framed Wall decor is easily customizable; the name of your choice can be displayed among other Phillies star players. The elegant black frame looks great and can be hung anywhere thanks to the attached sawtooth hanger. The great-looking digital double mat format features the team colors and logo. Whether you purchase this great piece for yourself or the Phillies fan in your life, one thing is for sure: our decor is guaranteed to knock it out of the park.